We’d love your help. 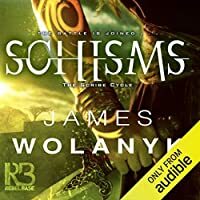 Let us know what’s wrong with this preview of Schisms by James Wolanyk. Three long years have passed since Anna, First of Tomas, survived the purge in Malijad after being forced to use her scribe sigils to create an army of immortals. Safely ensconced in the shelter of the Nest, a sanctuary woven by one of her young allies, Anna spends her days tutoring the gifted yet traumatized scribe, Ramyi—and coming to terms with her growing attachment to Three long years have passed since Anna, First of Tomas, survived the purge in Malijad after being forced to use her scribe sigils to create an army of immortals. Safely ensconced in the shelter of the Nest, a sanctuary woven by one of her young allies, Anna spends her days tutoring the gifted yet traumatized scribe, Ramyi—and coming to terms with her growing attachment to an expatriate soldier in her company. To ask other readers questions about Schisms, please sign up. The first book afterwards wasn't going to keep reading it. But saw it was goodreads giveaway & On netgalley ...and here we are. The books are interesting and I keep reading them. I feel confused about this series like...?? But it's good. I didn't like the first book in the series and didn't intend to continue on. I had the same issues with this installment as the last. So if you didn't like the first book you probably won't like this, and if you did like it this may be right up your alley. James has done it again. Schisms is the second book in a trilogy. Schisms is a GREAT read! The structure of the world is phenomenal. My attention never wavered a single time in the sequel. Another great aspect was a time jump. Now, so many people really do a time jump wrong but not James. He really showed how one changed during this time, and how the character would react to new situations. So, I would give the character development an A. The cover is AMAZING. I loved the image used and the typo James has done it again. Schisms is the second book in a trilogy. Schisms is a GREAT read! The cover is AMAZING. I loved the image used and the typography is perfect. I recommend this book to everyone. 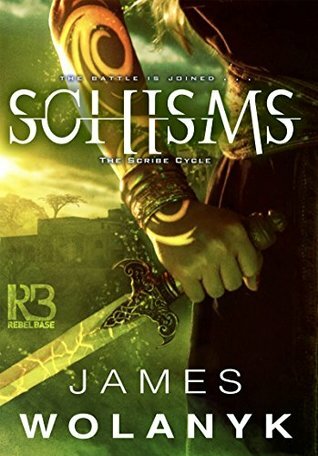 If you like a good fantasy story....pick up a copy of Schisms. Well, you should read Scribes first BUT Schisms is great. this was in interesting book, and the author is new to me. The storyline was good and kept my interest. Looking forward to diving more into this interesting world.